A brush for detangling your dog’s coat quickly, and more importantly gently without any tugging or pulling - even on the finest of hair. Using a patented two-tier teeth technology, the long teeth gently remove dirt, reaching confidently down to the undercoat, whilst the shorter teeth smooth the hair and protect against matting. Can be used on wet or dry hair. 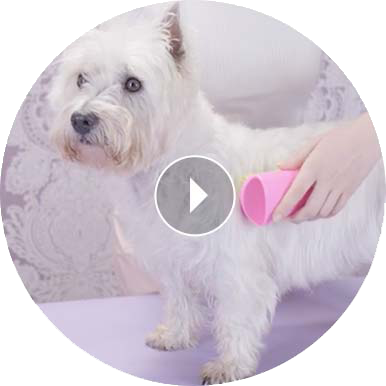 If you’re wondering what the best PET TEEZER is for your dog, the easiest way is thinking about your dog’s hair type. It’s not too dissimilar to the way we think about our own hair – is your dog’s hair fine, thick, curly, wavy or short? Find out which brush is best for your pet. For best results, brush gently at the knots until they begin to tease apart. Then give your dog a pleasurable brush all over to make them feel happy and relaxed! For light shedding breeds such as Poodles and Bedlington Terriers, knots and tangles can start to matt. We bet you’ve noticed them under the stomach and around the legs. It helps to gently brush their hair more often. Treating them to regular brushing also helps prevent problems like painful matting and skin irritations. The result? One content doggie! Super easy to clean. Simply lift the hair from the brush teeth and rinse with warm water. Allow teeth to dry naturally with teeth facing up.